Clarence Road and the adjacent Narrow Way, the nexus of the Hackney riots in 2011, have of late become home to several Japanese restaurants. There’s Sho Foo Doh at the Pacific Social Club, which paved the way for Japanese food in Homerton with their okonomiyaki, then Tonkotsu’s eastern outpost. Now there is Uchi. 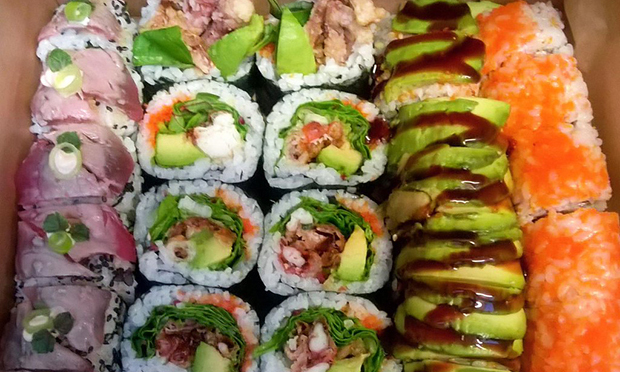 Although Uchi started as a sushi delivery service, dropping off responsibly-sourced sushi around Hackney by bike, you would not know it from the restaurant. Stepping in from the street through a set of noren (traditional Japanese curtains), we emerged in a warm, immaculately designed space built with quality materials, where we were bathed in soft light and soothing but crisp ambient music. Not a hint that this was potentially an upgraded takeaway. Uchi is active on Instagram and Twitter but its printed menu is scant and its website bare, so I wasn’t sure what to expect. It quickly became apparent that the real menu consisted of numerous daily specials, pegged to a lattice on the wall. Although they serve skewers, nigiri and rolls, Uchi is not a yakitori or sushi restaurant, but a self-described home-style café, offering a range of small dishes designed to be shared over several hours and many pints of cold Asahi, or high quality sake. There was nothing exceptionally surprising on the menu, which featured tried and true favourites such as karaage (deep fried) chicken and salmon nigiri. I had hoped for chawanmushi, a hard-to-find home-style dish – perhaps this will be a future special. The dishes were without exception excellently prepared and presented. I enjoyed the hijiki seaweed salad with sweet beancurd, which had a briny, pleasantly fetid taste. The sashimi was very fresh, served at the proper temperature, and the diner had the option of eating their prawns with the head still on (one of our party was happy to do so). There were original vegetarian options such as eryngii mushroom and spinach nigiri with black rice. Dinner and a couple of drinks averaged out at about £40 a head, but the price seemed fair given how carefully and precisely the food was assembled. Uchi truly felt like a neighbourhood restaurant – minimal marketing, little to no press, no fanfare: it’s just quietly getting on with things, while locals start to filter in.